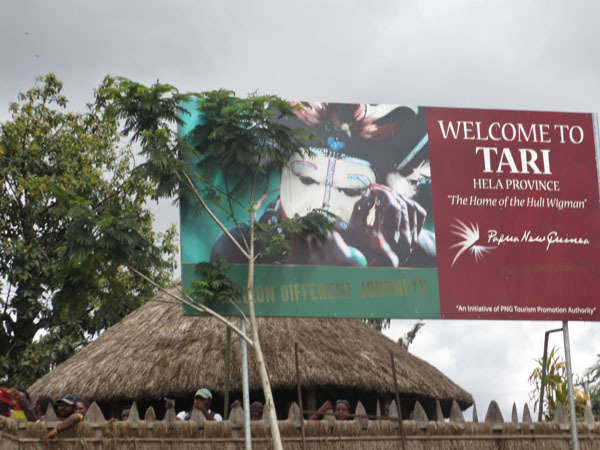 On the 25th we flew from Port Moresby to the Tari Valley. We checked in at the Makara Bird View Lodge. We spent the afternoon birding along the local roads. It was not until the 1930s that the outside world became aware that there were tens of thousands of inhabitants of this inaccessible (except by air or great effort) highland area. Gold miners from Australia looking for their fortune made their way into the area and did indeed discover gold. There is a documentary entitled “First Contact” that includes footage of the encounter between the explorers and the residents. I have not seen it, but it was described to me by one of our leaders and I plan to try to get a copy and watch it. 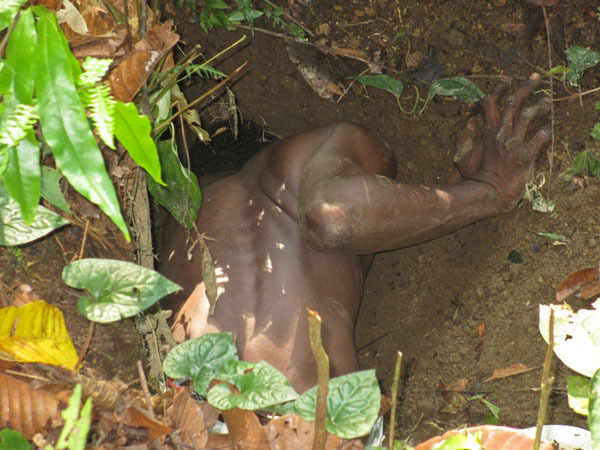 The Tari Valley is populated by the Huli Tribe, widely known for their “wigmen” cult. We spent part of an afternoon with a group of Huli Wigmen, adorned in their head pieces made from matted human hair and the feathers of parrots and birds-of-paradise. 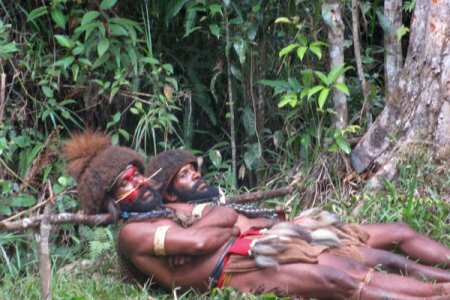 The wigmen sleep on their backs with their necks resting on poles to avoid damaging the wig in process. At 6900 feet of altitude, our lodge had a refreshing mountain climate. Our local guides were very helpful in seeking out some of the rarer and more spectacular birds of the area. One of our first views was of the lovely King of Saxony Bird of Paradise. The very long and colorful feathers that protrude from its head are unique in the bird world. This was a very productive site for finding Birds of Paradise. 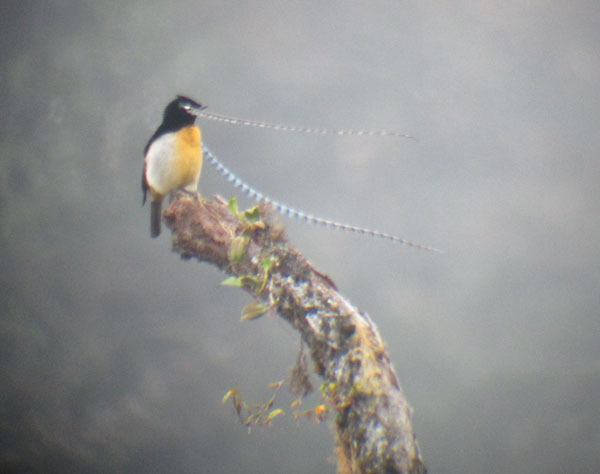 During our stay here we had great views of Superb Birds of Paradise, with their protruding iridescent breast-shield, an unbelievably vivid Blue Bird of Paradise, Ribbon-tailed Astrapias, and Princess Stephanie’s Astrapias. During our stay here we had to do some shuttling around to find areas that were not shrouded in fog or experiencing a steady but light rainfall. This was accomplished generally by moving up or down the mountain and we usually were able to find areas that were conducive to birding. It was a great place in spite of the weather issues. Among the birds seen at Tari Valley were: a Brown Quail, flushed from the roadside while walking, Bar-tailed Cuckoo Dove, Papuan Mountain Pigeons, Papuan Lorikeets, Plum-faced Lorikeets, Yellow-billed Lorikeets, Orange-billed Lorikeets, Brehm’s Tiger Parrot, Painted Tiger Parrot, Modest Tiger Parrot, Shining Bronze Cuckoo, Brush Cuckoo, Sooty Owl, Marbled Frogmouth, Mountain Owlet-Nightjar, Black-throated Honeyeaters, Marbled Honeyeaters, Common Smoky Honeyeaters, Yellow-browed Melidectes, Belford’s Melidectes, Grey-streaked Honeyeaters, 3 Scrubwren species, Crested Satinbird, Fan-tailed Berrypeckers, Crested Berrypeckers, Black-breasted Boatbills, Great Wood Swallows, Black-shouldered Cicadabird, Black-bellied Cuckooshrike, Black Sittella, Brown-backed Whistler, Regent Whistler, Black-headed Whistler, Long-tailed Shrike, Black Fantails, Friendly Fantails, Dimorphic Fantail, Blue-capped Ifritas, Slaty Robins, Island Leaf Warbler, Papuan Grassbirds, Capped and Papuan White-eyes, Island Thrushes, Hooded Mannikins and NewZealand Pipits. During our stay at Tari Valley we birded at Mekara Bird View Lodge, at the “Blue BOP” (Bird of Paradise) Village, around the Tari Gap, “Benson’s” Trail and Aduakambe Village. (Benson was our able local guide). On the morning of the 29th we flew from Tari Valley to Port Moresby where we were expecting to connect with a plane to Mount Hagen. Our troubles with internal flights continued, however, and the Mount Hagen flight was cancelled. We managed to get set up in a much nicer hotel than the first time we were stranded in Port Moresby. Our flight the next morning (the 30th) was delayed and we did not arrive at our Mount Hagen Lodge until early afternoon, in effect losing another day of birding in the whole process. After our flight back to Port Moresby from New Britain and lunch at the Lamana Hotel, we birded on the campus of Pacific Adventist University near Port Moresby. 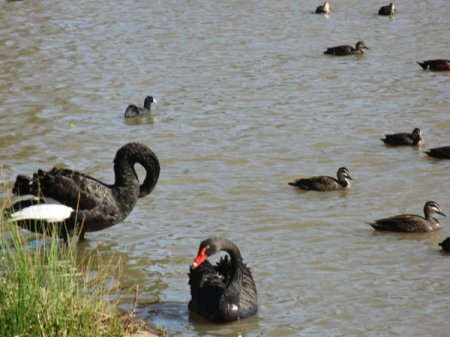 The campus contains open areas, including gardens and patches of habitat suitable for a nice variety of lowland species. Among the new and more interesting species seen there were Spotted, Plumed and Wandering Whistling Ducks, Green Pygmy Geese, a nice selection of egrets and herons (including a Pied Heron), Black, Whistling and Brahminy Kites, colorful Comb-crested Jacanas, Bar-shouldered Doves, Orange-fronted Fruit Doves, Torresian Imperial Pigeons, Dusky Lories, a well disguised and very odd looking Papuan Frogmouth, Blue-winged Kookaburra, Fawn-breasted Bowerbirds and New Guinea Friarbirds. The next morning we departed early to the Varirata National Park, located in the foothills above the city. 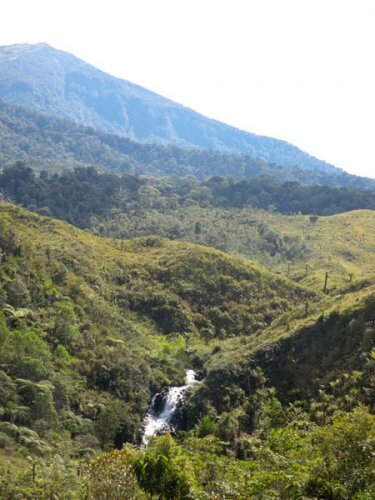 On the way, we passed the trailhead of the notorious, and still honored, Kokoda Trail, where, with great suffering and loss of life, the Australian and local Papuan troops halted the Japanese march during the Second World War. Dry eucalyptus forests line the quiet access road to the park. Once in the park we spent the morning slowly walking the narrow trails that criss-cross the moister evergreen hill forest. From there we had some excellent views of Port Moresby and the coastline. Our bird of the day was intended to be the beautiful Raggiana Bird-of-Paradise. We were not disappointed. The colorfully plumed males were in full cry throughout the park as they sought to inspire the interest of the drabber, but quite lovely in their own right, females of the species. Unfortunately, my little point and shoot camera could never quite get a good picture as these birds cavorted through the tops of the tall trees, so you will have to Google Raggiana Bird-of-Paradise to see what this great bird looks like. Among the nicer “incidental” new birds of the day were a Brown Goshawk, Little Eagle, Slender-billed Cuckoo-dove, Pink-spotted Fruit Dove, a Barred-Owlet Nightjar, a spectacular Brown-headed Paradise Kingfisher, Rufous-bellied Kookaburra, an elusive, diminutive Yellow-billed Kingfisher, Rainbow Bee-eaters, White-shouldered Fairy Wrens, several species of plain and small Gerrygones (gerigonees, phonetically), Black Berrypeckers, Yellow-breasted Boatbill, Black-backed and Hooded Butcherbirds with their crow-like looks and surprisingly beautiful songs, Varied Trillers, Little Shrikethrush, Hooded Pitohui, Spangled Drongo, Chestnut-bellied Fantail, several Monarchs and Flycatchers, Lemon-bellied Flyrobins, Pied Bush-chat and Red-capped Flowerpecker. 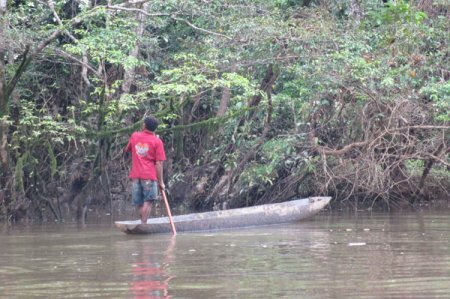 On our final day in the Port Moresby area we drove to the Hisu Mangrove area by the Brown River. This is flat, hot, tangled and muddy territory. We stuck to the road, almost literally. Along the way we encountered a pig hunting party that had just had success. Two young boys of about 12 years of age or so were carrying a large sow (200 pounds, I would guess) that had been shot and tied by its feet to two sturdy poles, which the boys had somehow gotten to their shoulders as they carried the bounty along the road back to their village. 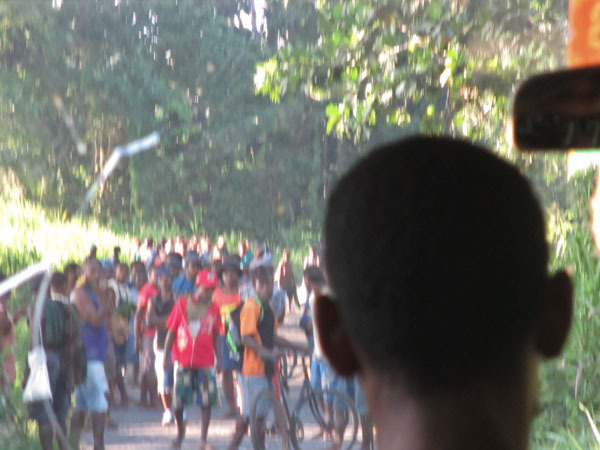 They were preceded by the apparent shooter, a young man in fatigues and a very large gun, several snarling hunting dogs and a few others helpers from the village. Unfortunately, I left my camera in the bus and missed a good photographic opportunity. On the other hand, it would be difficult to make out many features because all of the participants were caked with still wet mud. After exploring the mangrove and Brown River area we drove to Hisu Lake. To get to the lake we walked though a local farmer’s building site. 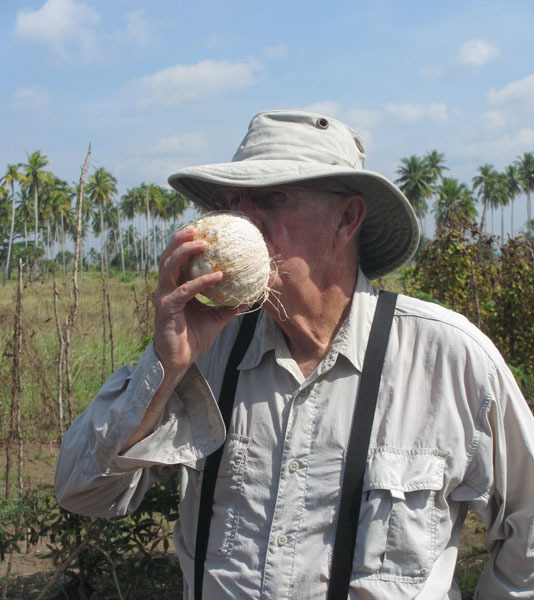 After scoping the lake, we stopped at the farm where the boys harvested some fresh coconuts for us. We sampled coconut milk fresh from the machete carved nuts. They contain a surprising amount of the sweet liquid. 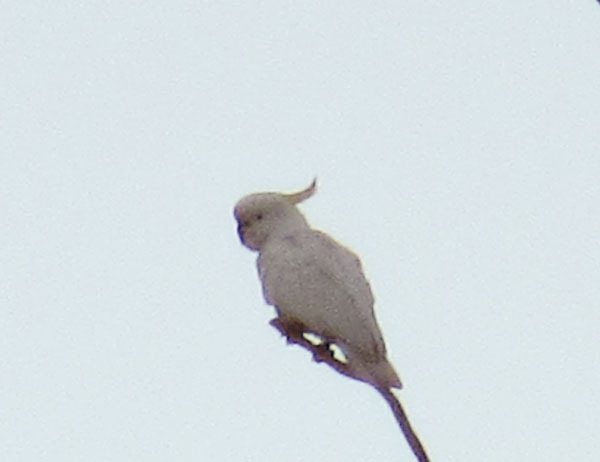 The new and interesting birds of the day included a Striated Heron, Papuan Harrier, Black-mantled Goshawk, Swift, Lesser and Crested Terns, Coroneted Fruit Doves, Orange-bellied Fruit Doves, Palm Cockatoos, Striated Lorikeets, Red-flanked Lorikeets, Pheasant Coucal, Black-billed Coucal, Little Bronze Cuckoo, Barking Boobook (Owl), Common Paradise Kingfisher, Collared Kingfishers, Brown-backed Honeyeater, Mangrove Gerygone, White-throated Gerrygone, Lowland Peltops, Grey Shrikethrush, Black Thicket Fantail, Shining Flycatchers, a Golden-headed Cisticola, Olive-backed Sunbirds, , and, on the mammal front, an Agile Wallaby. I left my hotel in Cairns about 4:30 a.m. to depart at 6:45 a.m. for Port Moresby, Papua, New Guinea. The flight went smoothly and I met the Rockjumper leaders at the Lamana Hotel in Port Moresby. 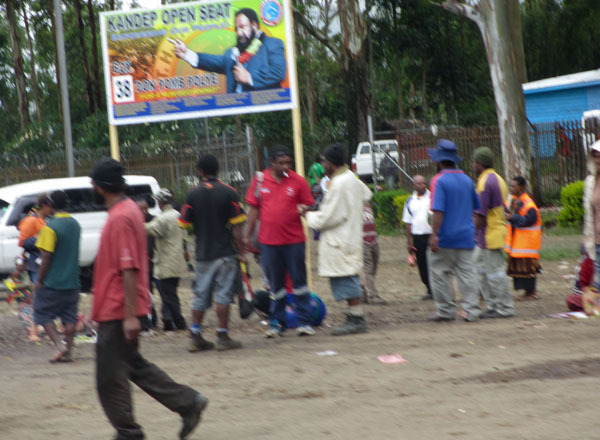 After lunch we boarded a bus for the Port Moresby Airport to get our 3:00 p.m. flight to Hoskins on New Britain Island. At 6:00 p.m., having spent a hot afternoon in the small and crowded terminal, we were told that the flight had cancelled. Several hours of negotiating with the airline and the hotels resulted in a booking for all of us in a dubious appearing hotel for the night. The Lamana Hotel would not accept the rate the airline offered. We had vouchers for a meal at the hotel and it was barely edible. The next morning we returned to the airport for our rescheduled 10:00 a.m. flight to Hoskins. It left about noon and we arrived, finally, on New Britain. The delay took a day out of our anticipated 4 days of birding on New Britain. 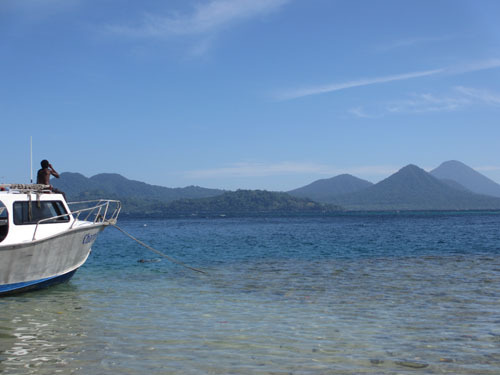 New Britain is located in the warm Bismarck Sea just to the north of mainland New Guinea. 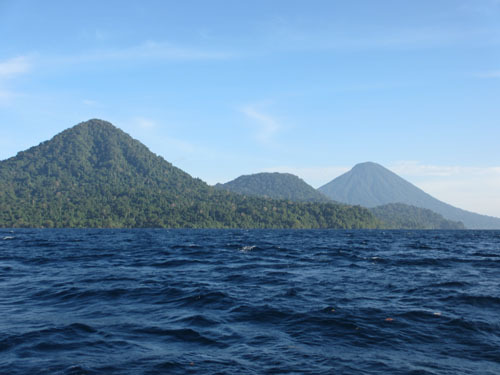 It is the largest of the string of volcanic islands known as the Bismarck Archipelago. 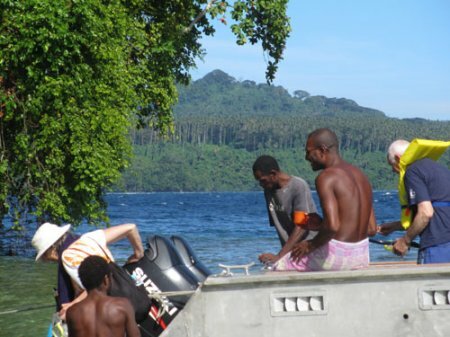 From Hoskins we drove to our lodge on Kimbe Bay. The area from Hoskins to Kimbe Bay looked more prosperous than Port Moresby. I suspect that is related to the extensive palm oil and coffee plantations and the processing plants for palm oil that line the road between Hoskins and Kimbe. We stopped in Kimbe at the Kmart for some supplies. The destination, our lodge at Walinde, was a welcome sight. We all enjoyed our stay there in lovely, raised cottages, and the food and service were excellent. We managed to find a few birds on our drive and on a walk up into the foothills to Tomara Ridge after our arrival at Walinde by the sea. These included Eastern Osprey, Brahminy Kite, White-bellied Sea Eagle, Red-knobbed Imperial Pigeons, Blue-eyed Cockatoos, Red-flanked Lorikeets, Eclectus Parrots, Pied Coucal, Violaceous Coucal, Moustached Treeswifts, Blyth’s Hornbill, White-bellied Cuckooshrike, Bismarck Crows, Metallic Starlings, Singing Starliings, and an impressive Flying Fox. The next morning we boarded the bus again for a long, slow and bumpy ride to find the nesting grounds of the strange Melanesian Megapodes at the Pokili Wildlife Reserve. We drove on very primitive tracks along the ocean. As we neared the nesting grounds, our progress was halted by a mass of people blocking the road. I don’t know what was said or what was done to clear the road for us, but about 5 of the local women boarded our bus and rode with us to the nesting ground. There they joined some earlier arrivals in digging for Megapode eggs, then boiling and wrapping them. The eggs are a major source of protein for these folks. Apparently they do not take so many that the birds become extinct, as there were a fair number of Megapodes skulking about in the trees. We spent a fair amount of time in the Pokili Conservation Area, looking for other birds. After a lot of effort by our guide, Rich, we finally were able to see a beautiful Black-capped Paradise Kingfisher in the dense understory. During the long ride back and in the afternoon, while relaxing at the Lodge, and hiking to Kilu Ridge, we saw a number of new birds, including Pacific Reef Herons, Lesser Frigatebirds, Swift Terns, Common Terns, Knob-billed Fruit Doves, Yellowish Imperial Pigeons, a surprisingly cooperative New Britain Boobook (Hawk-owl), Red-chinned Lorikeets, Red-flanked Lorikeets, Singing Parrots, Oriental Dollarbirds, Collared Kingfishers, Sacred Kingfishers, Black Myzomela, Black-bellied Myzomela, Pacific Swallows, Black Sunbirds, and Buff-bellied Mannikins. On our final day we enjoyed a boat trip to the very small Resorf Island. From the water, we could look back on the coast line of New Britain. We spent a lovely morning there, snorkeling, watching for birds and eating a picnic lunch on the beach. Upon our return we walked to the Nature Center. New birds seen during the day included a Black Noddy, Black-naped Terns, Nicobar Pigeons, Island Imperial Pigeons, Beach Kingfishers, Common Kingfishers, Sclater’s (Scarlet-bibbed) Myzomelas, Mangrove (Golden) Whistlers, and Shining Flycatchers. After enjoying another fine meal and night of rest at the Walindi Resort we returned to Hoskins for our flight back to Port Moresby, where the three of us who were going on met the 6 new folks that would be with us for the remainder of our trip. 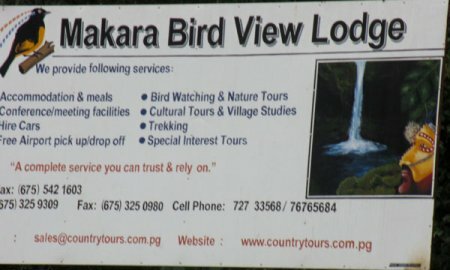 I was one of 8 or 9 participants in Rockjumper Birding’s tour of Papua New Guinea (PNG), including its smaller, adjacent island of New Britain, from July 18 through August 8, 2012. PNG is a large, mountainous island located near the equator in the southwest Pacific Ocean, (Oceania) generally north of near-by Australia. PNG occupies the east half of the island of New Guinea. The west half of New Guinea belongs to Indonesia. 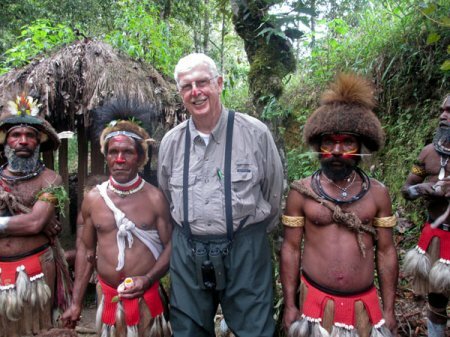 PNG is about the size of California and has a population of 6-7 million people. By comparison, the population of California is about 38 million. 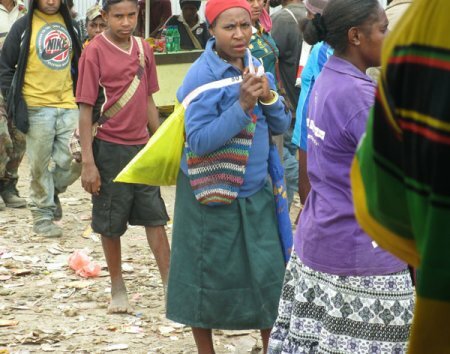 Over 800 languages are spoken by the natives of PNG, more than 10% of the total languages of the world. Many of the languages are spoken only by tribes occupying certain villages, or small groups of villages. Languages are often unrelated to any other, i.e., are not dialects or accents, and the speakers of one language often cannot understand their neighbors. Most of the residents still reside in the interior of the island (the Highlands) where they engage in subsistence agriculture (mostly yams and pigs). Literacy in any language is less than 50%. There is no road system connecting the major population centers (Port Moresby and Lae) with the rest of the country. Transportation is mostly by air or water. 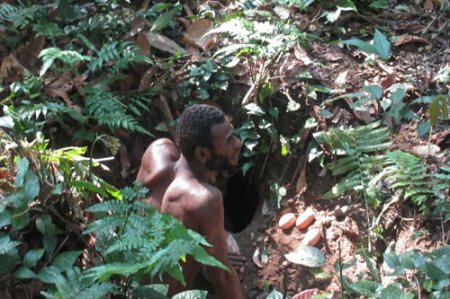 Until the 1900s headhunting and cannibalism were practiced by some of the interior tribes. Land ownership is vested, if at all, in the community, or tribe or particular families within an area. In general, an individual cannot pass ownership of land to other individuals. 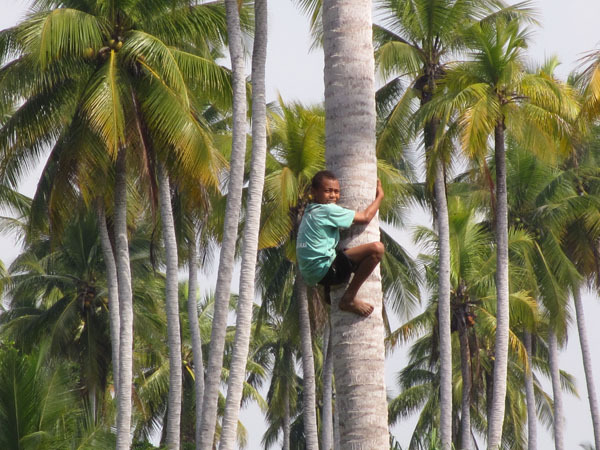 Violence among neighboring tribes protecting their turf has long been an accepted way of life. Even today, many of the men carry machetes wherever they go. This has created serious problems within the cities as migration from the country-side to the cities is increasing, and many of the new arrivals bring with them their old animosities. The Island was very late to be taken over by Europeans. The Germans annexed the north half of PNG in 1885 and held it until after World War I (1918). The British took over the south half about the time the Germans claimed ownership of the north half. They remained in control until 1902 when they turned it over to Australia. The Australians continued to administer the south half of PNG along with the former northern German area until the Japanese liberated PNG in 1941. After the loss of over 200,000 lives of Japanese and Allied soldiers, sailors and marines on PNG during World War II, Australia again administered PNG until the mid-1970s, when PNG became independent. To the surprise of many, PNG decided it wished to be a part of the British Commonwealth of Nations, and so the head of state in PNG is Queen Elizabeth. 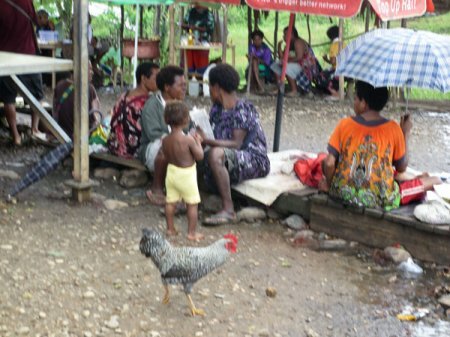 The principal spoken language of PNG is Pidgin English, called “Tok Pidgin”. Other official languages are English (not widely spoken) and Motu (spoken by a diminishing number of older residents). Many of the residents also speak (or only speak) one of the over 800 languages which still prevail throughout the island. I saw quite a few people reading one of two English language newspapers, which have good coverage of PNG events, especially the elections which were just then concluding, as well as a good sampling of world news. The people of PNG are generally quite poor. At least half of the many people I saw wore no shoes. PNG has considerable natural resources, such as gold, copper and nickel, and mining is a source of income for the country. Most of the mining operations are Australian controlled. Oil and gas is present is substantial amounts, and a couple of American companies are actively developing this resource. Recent economic performance has been among the best in the world, but it started from a long way down. I was attracted to PNG primarily because it is the only place in the world to see Birds of Paradise. The Birds of Paradise family (Paradaisidae) is arguably the most spectacular of all over 200 families of birds throughout the world. I saw most of the Birds of Paradise that could reasonably be expected on the itinerary we followed. These, as well as the other birds seen on this exciting trip, will be noted in the posts to follow. I had a couple of extra days to go birding in Australia before embarking on a 3 week birding excursion with Rockjumper Tours in Papua/New Guinea. I made arrangements for guiding services in Australia with Carol Probets of the Katoomba area. I took the train from the Sydney airport to Windsor where she met me and we began our birding in the Hawkesbury area a little before noon on July 13th. Grey Teal, Chestnut Teal, Hardheads, Australasian Grebes, Australasian Darters, Australian Pelicans, Intermediate Egrets, Cattle Egrets, a Royal Spoonbill, Purple Swamphens, Dusky Moorhens, a pair of fly-over Yellow-tailed Black Cockatoos, Superb Fairy Wrens, a Brown Thornbill, and Red-browed Finches. We made our way slowly into the beautiful Capertee Valley in order to arrive at our lodging for the night, the Binalong Cottage. We arrived as it was beginning to darken. Along the way we saw Australian Wood Ducks, a Brown Falcon, a White-faced Heron, Crested Pigeons, a scruffy looking Wombat, Crimson Rosellas, Little Wattlebirds, Noisy Miners, Lewin’s Honeyeater, White-plumed Honeyeaters, a Grey Fantail, Grey Butcherbirds, and some Red-whiskered Bulbuls. 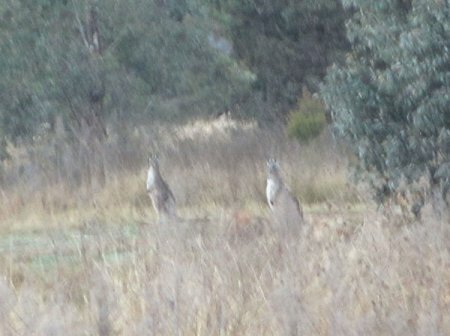 In the morning I was treated to a look at a troop of Eastern Grey Kangaroos foraging in the grasslands close by the Cottage. Grey Shrike-thrushes, Restless Flycatchers, a nice flock of White-winged Choughs, Zebra Finches, Double-barred Finches, Diamond Firetails, and Tree Martins. The undoubted “best bird” of the day, however, was the Regent Honeyeater, an endangered and beautiful bird. Actually, we saw at least 6 of them, and my Guide, Carol, was quite excited to find them present in such unusual numbers. 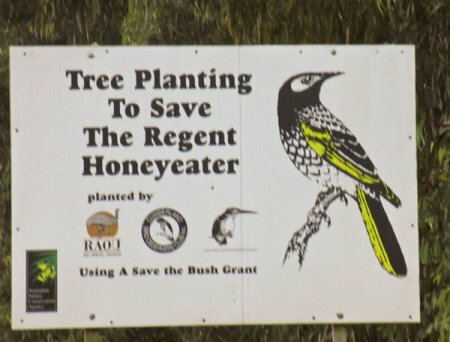 The Binalong Cottage is part of a larger farm which has been dedicated to plantings of native trees and shrubs designed to help the Regent Honeyeaters survive. In the afternoon we drove to Katoomba where I had reservations at the Three Sisters Motel. Along the way we stopped to look for birds, of course. Among those seen on this segment were Musk Ducks (very odd ducks), Australasian Shovelers, Pink-eared Ducks, Hoary-headed Grebes, Little Pied Cormorants, Little Black Cormorants, a White-necked Heron, a superb Wedge-tailed Eagle, Eastern Rosellas, Red-rumped Parrots, Red Wattlebirds, Yellow-faced Honeyeaters, Black-chinned Honeyeaters, and Common Wallaroos. The next morning in Katoomba broke cold and very windy, so we headed down into some protected ravines and valleys. We only had the morning for birding as Carol had another client scheduled at noon. Our primary target bird was the Australian endemic, the beautiful and strange Superb Lyrebirds. They were quite vocal but very hard to see. After a lot of effort we succeeded in tracking down a displaying male in the underbrush of a heavily wooded ravine. 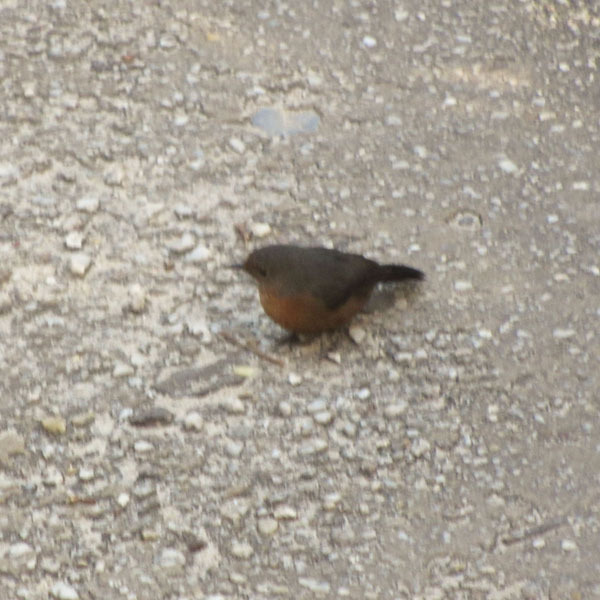 Although I got a decent look at it, I was not able to get any sort of a picture. Nevertheless, it was a satisfying look at a bird that I remember admiring, sketched in the old unabridged Dictionary that stood on a pedestal in my country school house at Highland Township Number 1 in northern Iowa. 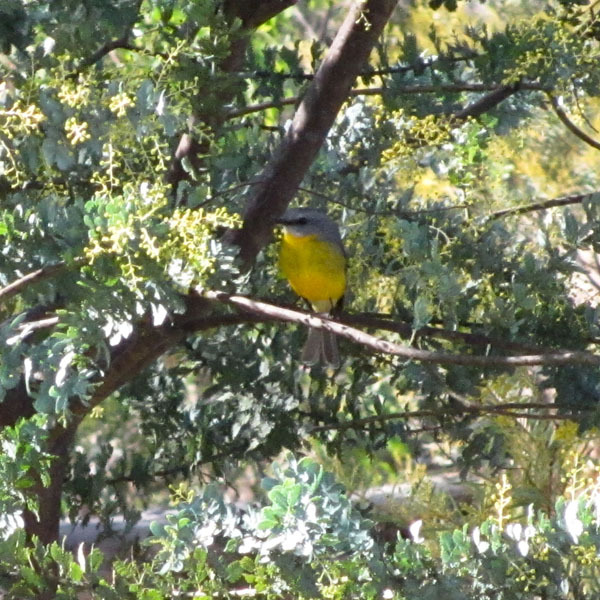 White-browed Scrubwrens, Large-billed Scrub-wrens, Brown Thornbills, Striated Thornbills, lots of Red Wattlebirds, White-eared Honeyeaters, White-naped Honeyeaters, beautiful New Holland Honeyeaters, and a shiny male Satin Bowerbird. I took the afternoon off to walk about Katoomba and to hike down to the rock formation known as the Three Sisters. I saw a few birds along the way, but nothing new. The next morning I caught the train back to Sydney and after checking into my hotel for the night, walked in the very nice park along the river, south of the Sydney Airport. Among the new birds seen there were plentiful Silver Gulls, Rainbow Parakeets, and Noisy Miners. The next morning I flew to Cairns and had time to hike to the Arboretum. There I was pleased to find Bush Stone Curlews, and an Orange-footed Scrubfowl. Toward evening I walked back along the Esplanade where there were Australian White ibis, a Black-fronted Dotterel, a Striated Heron and a few other shorebirds. Tomorrow I leave for Port Moresby, Papua New Guinea.